Administrators are health professionals, often clinician educators or researchers, who also oversee a team of coworkers within their department or division. They help make decisions for their institutions while advocating for the needs of their team. Learn about the multi-faceted role of an Administrator below. 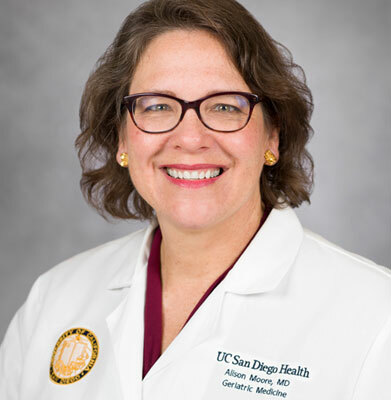 "I am truly able to have some influence at my institution and even beyond — on older adults’ clinical care, on the geriatrics educational needs of trainees, and on addressing scientific questions related to geriatrics and gerontology." 1.) What are the types of things you do as an Administrator? How might it be different from a career as a clinician, educator or researcher? I am a Division Chief at a university which, in my case, includes aspects of all four of these careers with an emphasis on administration. The administrative aspects include things like working with your division to develop and carry out a strategic plan, working with your faculty on their academic advancement, personnel management, financial planning and stewardship, development activities, intersecting with others inside and outside of your institution on many fronts and more! You spend a lot of time learning, thinking and communicating. 2.) What does a typical week look like in your role? My average week includes lots of regularly scheduled and ad hoc meetings to review and keep moving on initiatives (e.g., age-friendly health system), keep updated on divisional activities including financial, clinical, educational and research activities, Departmental meetings, and meetings focused on mentoring and being mentored in many domains, my ongoing and planned research, and others. I also have ½ day clinic a week and occasional other clinical duties. I try to keep blocks of time free to focus on activities that require sustained focus like completing a paper, preparing a talk, writing a grant. It sounds crazy and it is, but it is really wonderful because through these activities, I feel that I am truly able to have some influence at my institution and even beyond, on older adults’ clinical care, the geriatrics educational needs of trainees, and address scientific questions related to geriatrics and gerontology. 3.) Who would be a good candidate for this work? What are their interests? What skills do they need to be successful? A good candidate for a job as a Division Chief in part depends on the institution that is hiring and its needs. Some institutions are strongly research oriented so in that case it is good to have a research background. However, no matter the type of institution, a Division Chief must be truly committed to the welfare of the Division. The Division Chief must be able to understand and effectively advocate for the needs of the Division while also fulfilling the expectations of the Department that oversees the Division. Skills that are useful include leadership, management, generosity, communication, conflict resolution, delegation, discretion, and more.